While viewing a wish list, it’s easy to pledge an item for your child’s teacher or school. First, you must log into your TeacherLists account. This allows us to inform your teacher that you have donated and will be sending in the needed item. Don’t have an account? Click here to create one! Once you are at your list, simply click the word Pledge in green on the right hand side of the item. Then indicate the number of items that you are donating to the classroom in the pop up that emerges.. 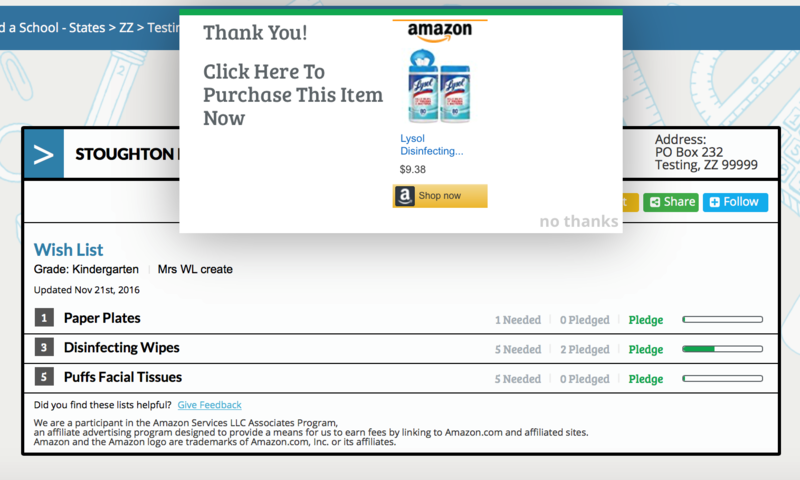 In the thank you screen that appears, you will be given the option of purchasing this item directly through Amazon. If you would like to do that, click the Shop Now button which will bring you directly to the Amazon site to purchase your item. If you would prefer you may also purchase the item through which ever retailer you prefer. You will receive an email confirmation that you have pledged an item, and your teacher has also been informed of your generosity. Thanks for supporting your child’s school! Now, don’t forget to purchase the item and send it in to your school! Parents are asked to create an account and then log in before pledging an item to a Wish List. This allows us to send you a reminder indicating the item and quantity you pledged to your teacher’s Wish List. In addition, we notify the teacher who was pledged what so they know what to expect. You do not need an account to simply view lists. How do I change my pledge to my child’s teacher’s Wish List? It’s easy to change the quantity that you are planning to pledge to your teacher’s Wish List. Simply log into your TeacherLists account, return to the list that you made the original pledge onto, and re-pledge an amount to the list. This will automatically change the number. You will get another email confirmation and your teacher will also be notified. How can I purchase items and have them sent directly to my child’s teacher? If you would like to purchase items online and have them sent directly to your child’s teacher, simply change the mailing address while conducting your on-line purchase. We always suggest confirming with your school beforehand and make sure to tell your teacher that a package is coming their way. Don’t forget to include the teacher’s name (or whoever the package should be delivered to) in the shipping information so that the package is properly delivered! Click here for more info on purchasing your child’s School Supply List or Classroom Wish List online!